Tarzan, having acclimated to life in London, is called back to his former home in the jungle to investigate the activities at a mining encampment. When they arrive a man named Rom who works for Leopold attacks the village they are at and captures Tarzan and Jane. With the help of Washington, an American who accompanied Tarzan, he escapes and sets out to rescue Jane by going across the jungle and Washington joins him despite being told that he might not make it. Once and a while my mother allowed me to choose a comic strip at the store when I was a small boy. I always opted for a Tarzan comic strip. It appealed very strongly to my imagination at that time. That ruler of the jungle who used lianas to travel and who ruled over those wild fellow residents of the jungle. Even films from the old days with Johnny Weissmuller captivated me. Weissmuller was more impressive compared to this Tarzan. I’m talking about the size of his thorax and those developed biceps and triceps. 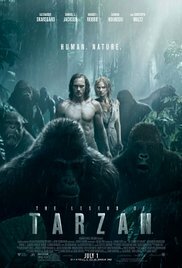 Tarzan in this movie is a tad less muscled and he’s already adapted to modern society. No “Me Tarzan.You Jane” conversations. He rather listens to the name John Clayton (Alexander Skarsgård). A distinguished English gentleman who walks around gallantly on two legs and speaks eloquently to his fellow men. He’s civilized, in other words. And then there’s Leon Rom (Christoph Waltz) who explores Africa while looking for valuable diamonds to fund the expansionism of the Belgian King Leopold II. Rom is a determined globetrotter who won’t let anything stand in his way so he can reach his goal. There’s one obstacle between him and the valuable diamonds. And that’s Chief Mbonga (Djimon Hounsou) who only wants one thing in exchange for those precious diamonds. And that’s Tarzan. Time for Rom to forge a plan and lure the lord of the jungle in a clever way to the dark African continent. The jeering jungle dweller is being accompanied by his lovely wife Jane (Margot “Focus” Robbie). Something else to be worried about. Is “The Legend of Tarzan” a bad movie? No, not really. But it isn’t an excellent movie either. It sometimes looks a little bit out dated. Even though Tarzan is placed in a totally different zeitgeist and his attitude towards the natives in Africa isn’t so explicitly authoritarian anymore. Even Jane isn’t such a sensitive screaming blonde in distress, who runs out of the jungle the moment a tiny wild animal shows itself. 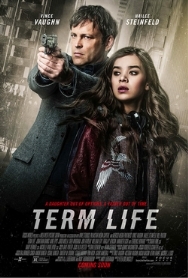 Ultimately, the film unfolds itself like a typical Tarzan story in which the terror of the jungle has to rescue his wife out of the hands of the bad guys. That’s how it also was portrayed in comics and the older movies. Lets say, it’s not such a legendary movie. Admit it. Tarzan doesn’t look like he could withstand the primal force of the Mangani and actually he should have ended up as a comfy carpet in some hut in the bush after receiving such hammer blows of this fearsome attacker. But I could live with that. After all, he’s a legend. This film is about THE legend. An unassailable and invincible superhero whose status reached iconic proportions. Clearly noticable was the unconvincing look of the group of gorillas. Compared to “The Jungle Book“, the CGI of the wild animals sometimes really looked miserable. Then again, the flock of ostriches advancing in a “Jurassic Park” kind of way, were beautifully designed. The thing that went over my head (probably because I’m thinking with a rational mind), was the way they were chasing the speeding train. The way those lianas made sure they caught up with it, was mindblowing. What ingenious system was constructed to achieve this? I couldn’t figure it out immediately. But it still looked really ridiculous. “The Legend of Tarzan” is suitable material for a cozy movie night . There’s sufficient action to enjoy. And Samuel L. Jackson has been recruited to provide the comic relief. Margot Robbie looks breathtaking again as the “lady in distress.” And the confrontation between Tarzan and the tribe of Mbonga was brilliant until the digitized gorillas appeared on screen. The easiest part was played by Christoph Waltz. He just had to play himself again. A great actor, but he’s stuck in the same routine lately. Despite everything, Tarzan was,is and remains a vibrant legend. I’m a fan of Tarzan only as far as the character being a near naked muscled attractive man. Otherwise, Tarzan is a very racist creation. Also, the movie in question deleted a scene which depicted a kiss between Tarzan and Capt Leon Rom. Having heard of this, I refused to pay to see the film, which it turns out did not do well in the theatres anyway.